Traveler Review for Private Tour in Addis Ababa, Ethiopia by Tour Guide Nurelegn W.
About Nurelegn W. Message Nurelegn W.
Two of us took this tour and thought it was great. The hike has a gentle, forested, bottom half and a tougher walk through high farm country above the forest. It would be easy to take a day walking just the forest, which had ample wildlife on the day of our walk, including bushbuck, colobus monkeys, wild boar, a troop of baboons and a great variety of birds. 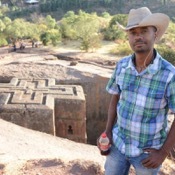 Nurelegn was an effective and knowledgeable guide and provided us with insights into life in Ethiopia. We had a long satisfying day in good company. TOUR GUIDE RESPONSE: Thank you very much Mr. Rose, We were Very luck to see all the animals in our Trekking , I could say the best I have ever seen in the forest. which some times not possible . that is the reason I want my customers not to Expect too much.